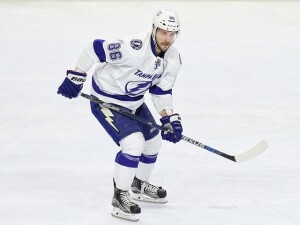 The Tampa Bay Lightning signed forward Nikita Kucherov to a three-year contract worth an average of $4.766 million per year, the team announced on Tuesday. Speculation about Kucherov re-signing with the Lightning heated up late Monday morning when TSN’s Bob McKenzie reported that negotiations were intensifying, but that a deal was not imminent. This increased when the Tampa Bay Times’ Joe Smith confirmed that Kucherov was on a flight from Russia to Tampa to finalize a deal. The three-year term is a bridge deal for the Russian forward, and his $4.766 average annual salary is far less than had been originally expected for Kucherov, given the market for a free agent of his caliber. Kucherov could have reasonably commanded a term of at least six years and more than $6 million per season, but the reality of the Lightning’s salary cap situation was that the team could not afford it absent a trade to move some salary. The Lightning had approximately $5.5 million in remaining cap space as Yzerman negotiated Kucherov’s contract extension. While an offer sheet from another team was always a possibility, the Lightning would have had the opportunity to match it. However, this would have put the Lightning in a major pinch given the need to be cap-compliant by the NHL’s deadline to submit each team’s 23-man roster by Tuesday at 5 pm ET. After Kucherov’s contract, the team is approximately $780,800 under the NHL’s $73 million salary cap, according to Capfriendly.com. With a three-year deal, Kucherov has the ability to sign a long-term contract with the Lightning after the 2017-18 season. 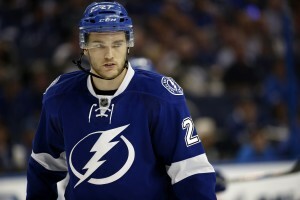 This may be a challenge for the Lightning, depending upon who the team is able to hold onto past this season, as Jonathan Drouin, Tyler Johnson and Ondrej Palat are each set to become restricted free agents on July 1st when their respective entry-level contracts expire. The trio will be up for substantial pay raises as Yzerman attempts to navigate what will be significant salary cap constraints for the second straight summer. Kucherov has averaged nearly 30 goals per season in each of the past two regular seasons and has scored 22 goals and 20 assists in 45 career playoff games. In 2015-16, he led the Lightning with 66 points during the regular season and was second in goals with 30. He followed by leading the team with 11 goals and 19 points in 17 playoff contests. Kucherov’s bridge deal means he is playing for less than his market value in each of the next three seasons, but if he can be even remotely as productive as he has been the past two campaigns, he sets himself up for a major payday if he reaches restricted free agency after 2018-19. He would be 26-years-old with arbitration rights and just one year from becoming an unrestricted free agent. The 5’11, 178-pound forward would hypothetically be six years into a productive NHL career and a demand for $8 million or more is not unreasonable. Steven Stamkos decided to forego restricted free agency earlier this summer to sign an eight-year, $68 million deal as a 26-year-old center to stay in Tampa Bay. Kucherov’s decision to re-sign with the Lightning caps an eventful summer for the club, after re-signing Stamkos, Allex Killorn and other free agents, while also being able to lock-in defenseman Victor Hedman before he reached unrestricted free agency at the end of this season and goaltender Andrei Vasilevskiy before he reached restricted free agent status. While Yzerman will certainly face a whole new set of challenges as he looks towards the future, the good news in the present is that the Lightning will open 2016-17 against the Detroit Red Wings on Oct. 13 with virtually the same roster it has had in each of the past two seasons.